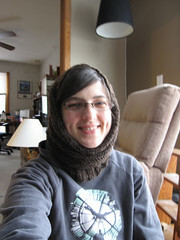 The cowl still needs blocking and probably a photo of me modeling it. The pink yarn is bamboo fiber, my first time spinning something other than wool or alpaca. It was a learning curve for sure! 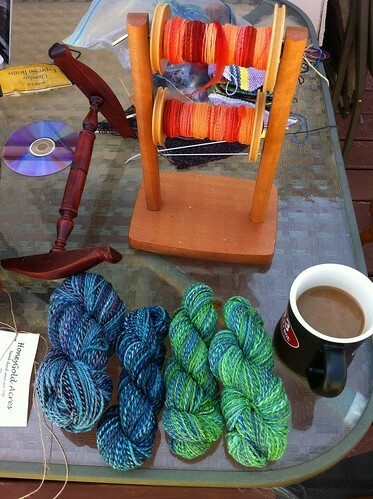 I have 8 more ounces of the same fiber to spin up soonish. The other yarn and singles are fiber from FatCatKnits.com. Lovely colorways! 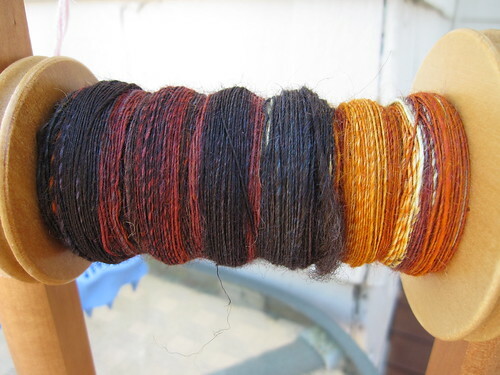 I love spinning dyed rovings to see how the colors are going to interact once the yarn is plied. Always a surprise and always interesting. 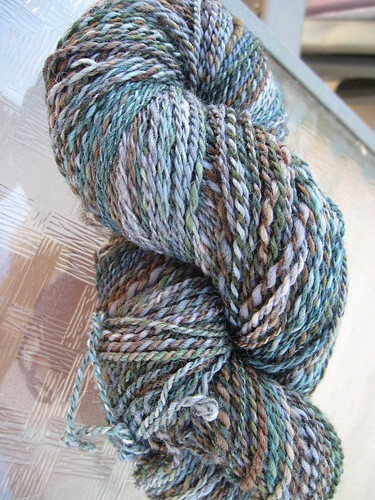 Beautiful handspun yarn – if I do say so myself. 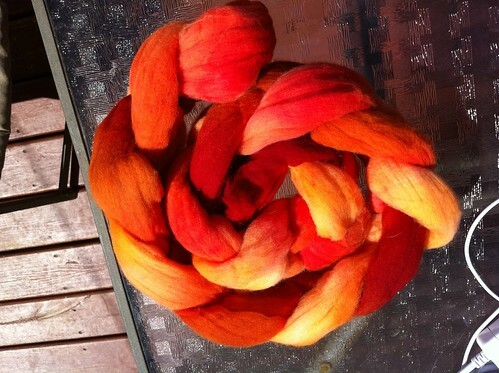 I’m quite pleased with how this yarn turned out, and now I’m itching to spin from some more hand dyed rovings. This is hand dyed merino top from HoneyGold Acres. I purchased it at the Shepherd’s Harvest Sheep and Wool Festival. The tag on the fiber doesn’t list a website, but it does have an email: hgacres@gmail.com. A quick google search also gave me a listing on localharvest.com if you want to know more about them – HoneyGold Acres. I was very pleased with this wool and excited to be able to purchase from other fiber folks in my state. The red roving was the only one I remembered to take a picture of before spinning, and even then I’d already unrolled it a bit. Here’s the “before” picture of the red/orange. 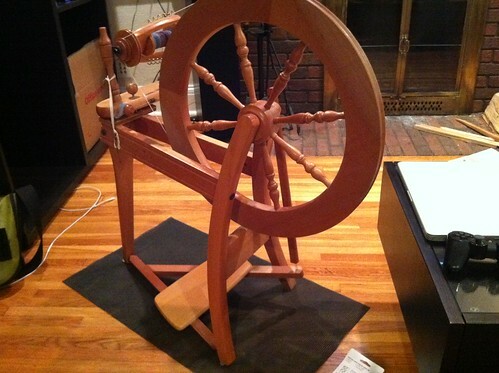 Though I haven’t been back at the wheel all that long, I feel like I’m getting better at spinning. I’m learning how to better tweak my wheel so that it works the way I need it to work, and I’m figuring out new methods for making the most out of my wool. For example, in the past, I would just tear off a chunk and spin until the bobbin looked full enough, then spin another bobbin to about the same amount. 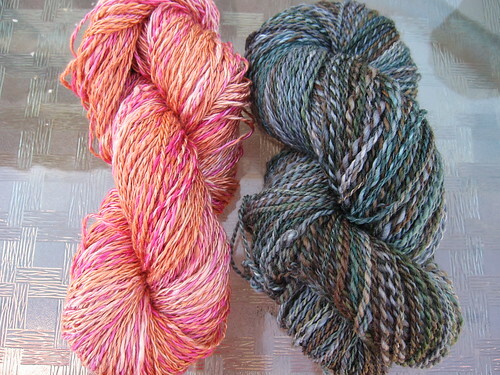 This is fine, except then I would end up with one really big skein and one smaller skein from the same 4 oz of fiber. 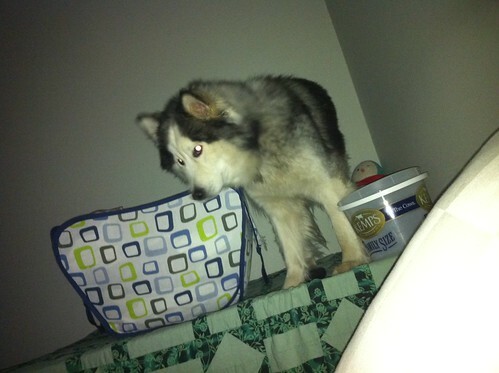 This is what happened with the blue/purple yarn pictured. With the green, I started out by dividing the roving in two, then dividing those two halves in two so that I would have two even skeins. I used my digital scale to weigh each one to make sure all the chunks of roving were about the same amount. Now I’m not wasting so much fiber. Overall, I’m glad to be spinning again and hope to keep learning more. I may even see a second wheel in my future…maybe. 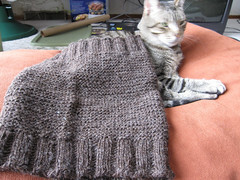 I always finish things and then let them sit around for weeks before weaving in the ends or blocking. Well, here is something I finally blocked and wove the ends into, probably in the wrong order (I wove the ends in after I blocked it). 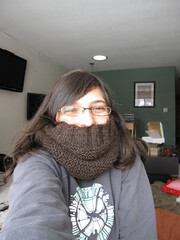 I call this the “Squishy cowl,” because it is big and squishy in garter stitch. It is made out of handspun coopworth yarn, spun from roving I got at the Wisconsin Sheep and Wool Festival, back that one time when I went. I was going to weave with the yarn, but when winding it into a ball I realized that, though it is pretty thin in some places, it’s too thick-n’-thin to be used as warp yarn, and I didn’t have anything else to pair it with. So, I went for something nice and simple, a wide garter stitch cowl with 3×2 ribbing as edging. It’s pretty wide because I only had a 24″ circular needle, not a smaller one to make it more snug. Also, I liked the idea of making it big enough that it could be pulled up and used as a hood if needed. CO 90 sts, place marker, and join sts to begin knitting in round. Knit in K3, P2 pattern for 12 rows. 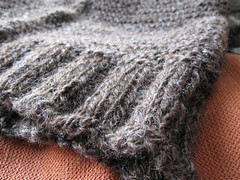 Knit in garter stitch for 9.5 inches. Keep in mind that since you are knitting in the round, you must knit one row, then purl one row, switching at the marker. This will create a small jog where the stitches switch, I just consider it the back of the piece. 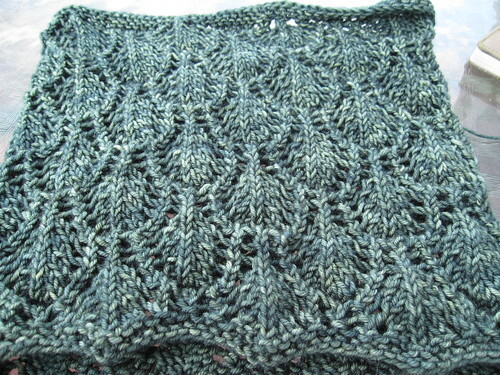 Knit in K3, P2 pattern for 12 more rows. 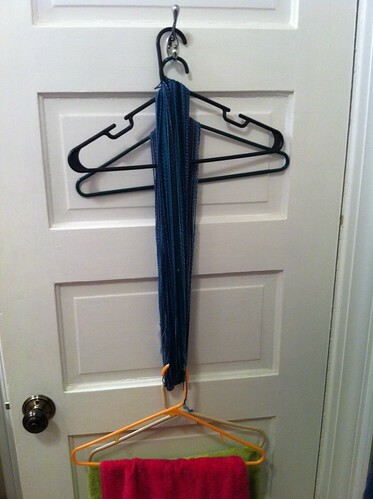 Bind off using your preferred bind off!